Few logos are more recognizable than the Harley-Davidson bar and shield logo. This iconic logo has been worn on Harley motorcycles in some form or another since 1910. The version we know today was introduced way back in 1965 and has graced not only motorcycles, but countless pieces of merchandise and apparel like helmets, t-shirts, boots, bandanas, and just about anything that can be worn, hung on a wall or displayed on a desk. This is clear if you’ve ever been in a Harley-Davidson dealership. Some of them seem like Harley gift shops that also sell motorcycles. 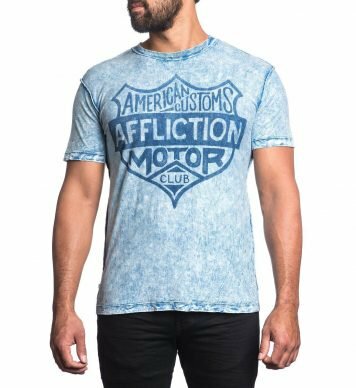 The latest brand to be accused of ripping off the Harley logo is Affliction. Very familiar looking bar and shield images with prominent use of the word "motor" have been appearing on the brand’s apparel. So familiar, in fact, that Harley-Davidson has filed suit in the U.S. District Court for Eastern Wisconsin against Affliction for copyright infringement according to Milwaukee business news outlet BizTimes. It began with a cease and desist letter sent from Harley on Oct. 18 alleging that Affliction is selling 20 products bearing a shield logo that infringed on Harley’s trademark. 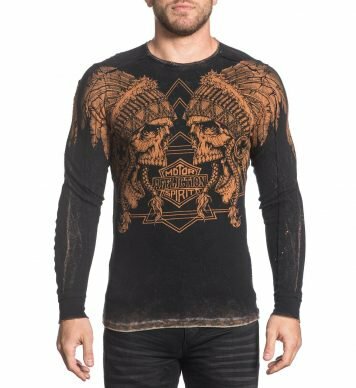 Affliction’s response was ending sales of six of the 20 products named in the complaint. In other words, it’s a big problem for Harley because by allegedly using the brand’s (highly recognizable) logo, it’s like Affliction is taking money out of Harley’s pocket. “By actively protecting our trademarks and patents, we also protect our dealers, licensees, shareholders and other stakeholders who are invested in our brand,” said Pflughoeft.